Pen tablets are an awesome invention. I don’t mean those tiny pads you use to sign electronic documents at the bank (although those are nice too). I mean the serious, professional models that artists use to create mind-blowing paintings and conjure Photoshop magic. They are pressure-sensitive, sense the angle at which you’re holding the pen, and are generally a huge step up from the mouse or trackpad when trying to create artwork using a computer. 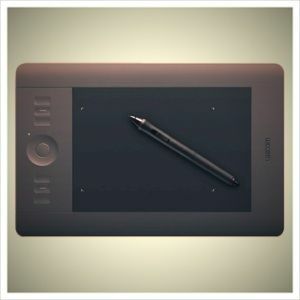 Recently, I was fortunate enough to receive a Wacom Intuos5 touch Small pen tablet. This is my second Wacom tablet, after an ancient model originally bought around 4-5 years ago. The advances in tablet technology are very noticeable, and the included software feels refined and intuitive. Simply speaking, this is a new generation of tablets, and you can read all about it below. We will be giving away a brand-new Wacom Intuos5 touch Small tablet to a lucky winner, so if you’d like to have a chance at winning it, just join the giveaway after the review. The Wacom Intuos5 touch Small retails for $229 and has an active area of 157mm x 98mm (6.2” x 3.9”). It is one of three models in the Intuos5 series, the other two being the Medium ($349, 224mm x 140mm) and the Large ($469, 325mm x 203mm). All three Intuos5 models support an optional wireless accessory kit that allows them to be used without cables, but today I will be reviewing the base configuration without the wireless kit. In terms of products from other companies, I must say there are not many viable alternatives to Wacom. Genius offers a number of pen tablets, such as the MousePen i608x retailing for $70 and aimed at occasional users, and the G-Pen M712X for $170, aimed at professional artists and designers (the same market the Intuos5 is targeting). The pro model G-Pen has a resolution of 4,000 LPI (lines per inch), significantly less than the 5,080 LPI offered by the Intuos5. It also offers only 1024 levels of pressure sensitivity, while the Intuos5 supports 2048 levels of sensitivity. While specs often don’t tell the whole story, they do count for something – and the top-of-the-line model from Genius does not match the Intuos5 by the numbers. Then again, it also retails for $59 less than the Wacom and has a larger working area than the small Intuos5 model (304mm x 184mm). The included pen stand feels sturdy, and should look lovely on most desks. The pen fits into it vertically, and can also lie across it in a molded groove as shown above. In a word, the Intuos5 is gorgeous. The first thing I noticed is that the Intuos5 is completely blank: There isn’t a single label on the tablet’s face. Not a single button is visually marked, and even the Wacom logo is embossed. The tiny dots of color are actually indication LEDs. I find that brilliant: Since you will be touching the tablet all the time, any ink markings might wear off. Not using any labels ensures the tablet always looks at its best. There are markings though, as you can see above: These are tactile bumps on key buttons. Like the primary work surface, the buttons are pressure-sensitive: Rest your finger lightly on a button, and a semi-transparent on-screen legend pops up. Apply a bit more pressure, and the button will activate. The on-screen legend is brilliant, because you don’t have to take your eyes off the screen to find the button you are looking for. This powerful dialog lets you change every aspect of the tablet’s behavior. You can freely remap buttons, assigning them with tablet-related actions or arbitrary keystrokes as you see fit. Not only that, but you can tweak and change the tablet’s settings for each individual app you use. For example, one app may use Tab to hide all toolbars, while another may use Escape. With the Wacom Tablet Properties dialog, you can have the same physical tablet button send two different keystrokes, depending on the application you are currently using. If you have a large desktop work area, being able to constrain the pen to just one window or even one part of the window can help you draw more accurately. Then again, if the tablet itself is too large for you (unlikely on the Small model), you can limit its active surface area. The Standard Gestures tab shows the default gestures, with an animated display that rotates between the different gestures, demonstrating them with simple animations. It’s all here: Rotating, zooming, scrolling, and swiping with multiple fingers. The four-finger swipe is interesting: It triggers Windows’ built-in Alt-Tab dialog, letting you swipe between all active windows. It is easy to use because you don’t have to keep your fingers down: You can let go of the tablet, then swipe again to switch to the next app, and so on. The Intuos5 is a precision instrument. While theoretically portable, I wouldn’t just chuck it in a laptop bag with no protection. It doesn’t come with a case, but Wacom does offer a case for it at $25. Also, being a pen tablet, it makes some assumptions about the way you work: For example, you are really supposed to use it with a desk. If you work with a laptop on a bed, or have a custom workstation How To Design Your Own Awesome Workstation How To Design Your Own Awesome Workstation I work in a tiny apartment, and use two 24” monitors. I needed a workstation that fits into a tiny niche, but can still accommodate me for many hours every day and let me work... Read More that doesn’t have a desk, you are not the user Wacom had in mind when they designed the tablet. I built a shelf just for the Intuos5, which you can see above. That makes it easy to store, but doesn’t help me when using it: I can use it by propping it on my lap, but when I need to work with my keyboard in parallel, things start getting awkward. Even the Small model has a sizable footprint, so expect to dedicate some desk space to the Intuos5. Another thing to consider is the pen and holder combo: Both pen and holder are finely made, but are not military-grade robust. In other words, if you have cats (I have three), don’t expect to just leave the pen in its holder on your desk or shelf. A curious cat can easily overturn the holder, causing the pen to tumble out, perhaps to the floor. At $70 just for the pen, this is not an accessory you want to absent-mindedly run over with your chair. At the end of the day, a pen tablet is just an accessory: It’s like a mouse, but much, much fancier. So, just like some applications work great with mice (Web browsers) and others don’t make such great use of them (word processors), the same is true for pen tablets: If you’re mainly creating vector graphics using CorelDRAW or Adobe Illustrator, you may not get so much mileage out of the Intuos5. But if you use something like Photoshop or Corel Painter to retouch photos, paint with natural media or do other raster work, a high-quality pen tablet makes a big difference even if you’re not a pro (and certainly when you are). If you have the money, my answer would be an unequivocal yes. I was very impressed with the Intuos5 as a device, in terms of hardware design, human engineering, and bundled customization software. That said, it will not make you an artist overnight, and you do need to set up your workspace so you can easily use it and make sure no harm comes to it. If you are serious about creating digital art, the Intuos5 can take you far. How do I win the Wacom Intuos5 touch Small Pen Tablet? The giveaway is over. Congratulations, Andy Monroe! I have a Bamboo and I like it because of the size. It is basically a mouse replacement, but for the money, and expense, I find it OK, but next time out I will go for the 5. I'm looking to try and convince my boss to get me one of these for work. I think I'm more likely to be successful if it's the cheaper (ie small) model. From one of your screenshots it looks like you have a dual screen set up. How do you find using the small with your dual screens? Oh, it's not a problem at all. The tablet itself is sensitive enough, but if I really want to work on a single app, I can just open the tablet's Options dialog and restrict its range of motion. This way, I basically "lock" it into a single window, or even a specific area within that window (say, just the drawing canvas). Sorry, but the winner shouldn't have been selected on June 15th? A month has already passed... not knowing is killing me! One day we might see the result. Personally, after a whole extra month went by, I gave up looking every day and just decided I'll keep the tab open and look once in awhile. Not really expecting to see anything any time soon either, to be honest. I also have all but completely given up even bothering to enter any of their other giveaways because this is at least #3 this year where nobody's been announced as the winner, even months later. Well, apologies for the massive delay! The winner has now been selected, it is Andy Monroe. Sorry all, Andy was selected as the winner and we're just finalising the details and he'll be enjoying his brand new Wacom tablet very soon! Did you log into MakeUseOf using your Facebook account instead of your Twitter account maybe? The winner has not been announced, yet. It should be soon and you will find the name in the top of this article. Has the winner been selected yet? thankss! Should have! Will see whether we can post the name, yet. The winner will be announced shortly. The article will be updated accordingly. You will see an announcement box in the top area of the article. Man oh man oh man oh man oh man, do I ever need to win this thing! I've been desperately needing 1 of these for a long time now and simply just cannot afford to buy even a Wacom Bamboo at the moment. The Intuos 5's are much nicer, and if I were to win 1 of them, I'd be so beyond ecstatic, I'd probably squeal like a girl, lol. I desperately am hoping to win this thing, cuz it would literally change my whole life for the better! The gadget looks super cool, BTW, Mr. Zukerman a well written review, this is the first post of yours which am reading here.,gotta check your site and also other posts. Entered the contest! I have a bamboo now, but I'm still hoping. I have just one quick question Erez/Tina; how many people usually participate in giveaways? I'm sorry if this has been answered somewhere. I'm a fan of statistics, and even if you can't give exact numbers, I'd still like to know if if's like a hundred of 10,000. Ahhhh sounds great,, can scribble away [no paper mess} be a nice challenge to learn, help create ,, and be awsome if can use photo;s on it momma mia !! Wacom Intuos5 tablet is new to me. Hope to win 1. It keeps telling me "The giveaway code you entered was incorrect. Please refresh the page to try again." Did you try again? There might have been a temporary issue. I have been collecting Money to Buy this Thing!!! i'll be like the happiest man alive If I win this!! I sketch by hand here's my work http://vishaldfreak.deviantart.com m dying to go Digital using this Tablet!! Love to have this to help with illustrations. fingers and toes crossed! my hands are trembling to touch this revolution.. this won't stop till i grab it.. This would make a great Father's Day gift. A really sharp looking tablet. i hope it'll be mine now..
great if able to own one! It looks fantastic. My artistic daughter would just love it. Windows 7 SP1+, Windows Vista SP2, Windows XP SP3, Mac OSX 10.5.8+ (with Intel Processor), USB port, color display, CD/DVD drive, and internet access. Linux is not listed, so it is not officially supported. so is sharing i.e. step 2 a must? Yes, step 2 is required. I have a Wacom tablet that is about 5 years old. It is great with Photoshop and Illustrator--it has changed the way I make art. I like you're treat to everyone and I'm hoping to win this I just want this so badly! I love you're treats to everybody I'm hoping to win this I like this so badly! Very nice, indeed. Wacom tablets are the best. This particular model seems to have a ton of great features. I'd love to have one and I hope to win, as I'm getting started in web graphics design. Would be nice to have the right tool to hit the ground running with. I really need a tablet for my projects but I'm broke as hell. I hope I will win this!!! A wonderful giveaway and opportunity from a great site. This would be so much easier than using my mouse to work with graphics and photos! Being a "lefty" myself it isn't always so easy to find things compatible and many times left handed persons need to make adjustments...or just get used to using right handed items. It's great to see this is easily used by both. Good luck to everyone that enters this great giveaway! Makeuseof has always been great and would continue to be great. Thanks Makeuseof crew. Awesome giveaway! This would really help with editing! The Tablet looks awesome I am currently using a genius 508 ,I would love to give it a try. Was checking Amazon on this and they list all three models, small, medium and large. I am seriously interested in obtaining one and my question is: what are the advantages of the larger sizes? Is it just more distance on the pad to move to increase precision or what? Just hurry up and send it to me, before I order one! Seems to be a very useful item! I don't understand your contest. Where is the explanation? Did I enter? The instructions are at the bottom of the article. There are two steps. See above for details. Good luck! June 15th? That's my birthday! What a wonderful birthday present that would be! This woul be pretty neat to have. hope to win this! : ) This is my dream gadget. This tablet would also be great to use for digital embroidery design & editing! Boy I hope I win this as it loos like a real great prize thanks MakeUseOf for the chance of winning this.. This tablet looks great. I like to draw, write etc, This is a geat tablet for drawing cartoons, This is funny, my 12 years grandson draws cartoons for several years now, this can make his drawings perfect with practice. Grrrrreat! thank you. MUO is truly a site that gives back a lot. We got our 11 year old daughter a Wacom Bamboo tablet, and she loves it. She uses it all the time (scared it might be a passing fad). Excellent for Photoshop or any graphics program. Need for new business starting up. NEED THIS FOR MY NEW BUSINESS. I'd like to do some photo editing, and this thing looks like it would help allot. Wacom's rock! I've had the "ArtzPad II", the "Graphire 3" and am currently using an "Intuos 4" (all small, I'm not made of money). I've even made a custom mount for my "Intuos 4" next to my keyboard that folds up and down over my mouse pad area to give me a proper working angle, cause they will take up some desk space (11"x7.75" for the Intuos 4 small) and for myself it's a little awkward using it laying flat. I can't and won't work without one. Cannot be beat for graphic design work and photo retouching. This would be such an awesome win. I enter every contest, giveaway i can but havent won anything yet. Wow, this looks amazing! Perfect addition to my Mac. This great tablet would be useful for me in so many ways! Did you try again? Maybe there was a temporary issue with the site. Coolest news, site reviews, apps and giveaways. Working now must have been to busy, Liked, Tweeted and +1 great giveaway count me in for this and thanks. Great review this sounds brill. Would love to play with this tablet. i'd like to try one of them.It looks interesting. ok i missed the spam check, if i did'nt speak english how counld i read it.. This is a GREAT tablet! An awesome giveaway - really nice piece of technology to have! Thanks MakeUseOf for giving us a chance to win this tablet! Keep getting The connection was reset, will try later. It IS an awesome tablet! I really could use this tablet upgrade! Well, as a Reverend, I have never 'entered' any kind of giveaway but I love this app. Would be a great tool for the ministry. I want to be a animator and I have a depp interest in photography ..I edit my photos alot.. and it would be a lovely gift for my animation and photography career. I own both an Intuos 4 tablet and a Bamboo pen and touch. I love the Intuos 4, and I think the interface for Intous 5 is brilliant. You don't have to move your eyes away from your computer screen to check the function assigned to a certain button, which is something you have to do with the Intuos 4. About the Bamboo, sometimes the tablet cannot make a difference between a touch input and a pen input, and that causes problems while working. I hope this is not the case for the Intuos 5. Thanks for a very thorough review, I wish to be the winner of the Intuos 5!!! Thanks for this amazing giveaway ! All the best to all participants. Were you able to enter after another try meanwhile? Yes, I just tried again after receiving your reply and YAY!!! Hope I win! Count me in! What a GREAT tablet! My daughter uses a less expensive Bamboo, and even that one she loves. this looks awesome! This sounds wonderful! I'm sure a lot of people are really hoping to win. Thanks for the chance. A well thought out design for designers. I shall win, I will win, I must win. I bought my first Intuos tablet in 1998. Sadly it stopped working about a year ago. I bought a bamboo tablet as an quick fix and MISS my other tablet. I should have just bit the bullet and gotten another Intuos instead of a Bamboo. Definitely going to get this one somehow. This would make drawing sooo much easier! What an awesome prize, OUTSTANDING! 'Can't wait to use it. Tablets are increasing in popularity. This model looks like a good competitor to the mix of tablets in the marketplace. Very nice review with plenty of solid content to actually see an learn more of the Wacom tablet. This is just perfect for working with images and a lot of other graphic creativity.Such an awesome giveaway and always wanted to work with a full featured easy to use pen tablet such as the Wacom Intuos5. This sounds like an ideal product to showcase on one of my broadcasts. I hope I win the tablet! This sounds like a great product to showcase on one of my broadcasts. It would be nice to win this tablet. This table looks very nice...hope I win. Oh, I do hope it can be used with a Mac. Find the respective Giveaway post on Google+. The code is mentioned in the text introducing the link. Good luck! Maybe I will start working on my art skills. I've been using a Wacom Bamboo with Pen & touch. It works great as a pen and only fair as a touch pad. Apple's Magic Track Pad supports more gestures and has much better control than the Bamboo. However I've never used this Intuos. My question is can anyone who has used both the Bamboo and the Intuos comment on the differences? Is the sensitivity perceptible? Are the touch features better? Is it worth the extra $$? If you are still looking for an answer to that question, I recommend posting it on MakeUseOf Answers. Is this giveaway valid worldwide or only for US residents? Worldwide. We will try to send anywhere. Owning this may convince me that I really do need a tablet. Owning this may convince me that I need a tablet. The tablet would help me greatly. As a disabled Vietnam Vet, this tablet would help me greatly. Tried to enter for the give away. I was told I had the code wrong code (though I can't believe it - maybe I forget to capitalize the "T" in Tablet) and when I tried to correct the mistake was advised the email address needed to be a unique entry and mine had already been used... I am confused. Is this world wide (EG can it be posted to Timbuktu or 'back of Burke') ? Or is it only for US residents ? The Giveaway is available to readers world wide and we will try to send it to whoever wins. Please try again and let us know whether the issue persists. Sorry for the inconvenience! I saw this on the web site and thought it was over, I could not find the page to enter. This would be a dream come true!!!! Housebound on oxygen my activities are limited and this is a true love of mine and something I've always wanted. GREAT giveaway! You can find it on our Facebook, Twitter, and Google+. Good luck! I have a Wacom Bamboo tablet and its pretty nice. It doesn't have all the bells and whistles of the Intuous, but it's pressure sensitive and costs half as much. Works well with Illustrator and Photoshop. If I had a Wacom tablet, and if it had handwriting recognition I would use it to input text into everything. Strangely, I can't seem to like it on Facebook, but I did share on Twitter and G+. Awesome giveaway! Love this! What a great Photoshop accessory! Though the intuos5 is essentially the same design as the intuos4 it has become more like the bamboo. For those who don't know the bamboo is a touch/pen sensitive tablet with several buttons on the side. It is the lower end, for home, type tablet so it isn't as sensitive to tilt or pressure and is lacking in a touch ring. The intuos4 did not have touch capabilities but it came with a mouse which, when the intuos was primarily for professional use, was what was wanted, a pen and mouse tablet. Now as the intuos is become more for personal use they have added touch and made the mouse, for only $69 more, an extra accessory. Fortunately, the intuos4 pen and mouse and other accessories work with the intuos5 so those upgrading from the intuos4 will have the best of both worlds without the cost of brand new accessories. Would love to replace my really cheap tablet with one that can actually do something worthwhile in editing pictures etc. This looks really really good. I had a tablet, but then it broke. >.< I'm so excited about this giveaway! Had an old Wacom Graphite... suddenly it stop working 'cause both pen and tablet got crap 'cause of overusing it drawing, painting, digitalizing my old drawings... couldn't afford a new one.. so... entering this hoping to have chance to restart with my hobby and passion once again!!! The tablet looks awesome! I hope I can get it. Fingers crossed! Done. Love never put a price to enter the GIVEAWAY contest . Interesting device, this could be useful. Interesting little device. Not sure if I have a use for a $250 mouse on steroids but I entered anyway. Thank you for the opportunity to win. Love your site, it's advice, reviews, humor and resources! To be honest i don't know if i will have much use for this. But wouldn't mind if i get a chance to use this for free . THis would work well for writing Japanese and Chinese! Great! I've always wanted one. Please God let it be me. I had a Wacom tablet way back in the day. I loved to use it. The functionality was awesome! Fingers crossed for this one, want it from a long time but can't afford it. wow, would love to win this!! awesome!! why is your comment highlighted in yellow colour? He isn't posting as a guest, but is logged in. I'm still new to Makeuseof,but do you have a guide or cheat sheet for tablet? Well, touch tables are essentially quite simple: You have a pen, and you scribble with it. Apart from that common basis, they all differ on features and quality, so it would be difficult to provide a single guide or cheat sheet for all. Do you have a particular graphic tablet you're having trouble with? Note that this is a pen tablet -- not a tablet computer like the iPad. It has no screen -- it is like a mouse, but with a pen instead. I never own any kind of tablet and don't know much about it.But since I'm participating in this giveaway,I might as well learn as much as I can about tablet. Oh, I understand! Well, this very review is the closest thing to a cheat sheet you can get for this pen tablet. :) If you win, just come back to the review and read it with the tablet in hand -- it would explain many things. For someone who loves his Photoshop this would be an excellent addition to my daily pass time. Great review on what looks like a must have.